Saturday morning, Cindy, Thomas and I were sitting in Tower Grove Park….meditating….as part of the Sitting in the Park group that meets every Saturday morning from 8:30 to 9:00 am. I was sitting with my eyes closed, noticing the sounds of the birds and the motorcycles, the church bells, the dogs, the kids, the cars, and the leaves in the trees being blown by the wind. Then thirty minutes were up and Cindy rang the bell. And I opened my eyes…. ….and there were four new people sitting there meditating with us! It was as if they had materialized, out of thin air. Or sprung up from the soil. 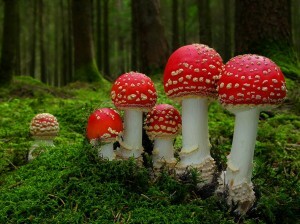 Like mushrooms! Of course, they had arrived on foot, like normal. But they had been so quiet. (Or I had been so oblivious.) They had come after we started, and had sat down beside us, filling in the circle, and joining in the meditation….. all without saying a word. It was really, really lovely. Thank you, folks. I hope to see you again.